US Airways 767 features a Boeing 767-200 from the US Airways fleet. A midsized commercial airliner, this type first saw use in 1982 and has been a popular aircraft with commercial fleets worldwide ever since. 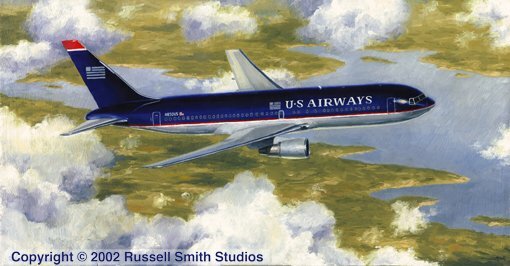 This painting depicts the US Airways 767 as it passes above Lake Norman after climbing out of the US Airways hub at the Charlotte-Douglas Internatinal Airport in Charlotte, NC.